Long time readers will know that I tend to keep my skincare routine pretty simple. I stick to what I know and don't tend to experiment too much. Why try to fix something that isn't broken? However when I a package popped through my door with a selection of products from Yes to in it, I thought i'd break the rules a little and try a few new bits. You would have read my thoughts on the Yes to Cucumber cleansing gel in my Cleansers on trial blog post. 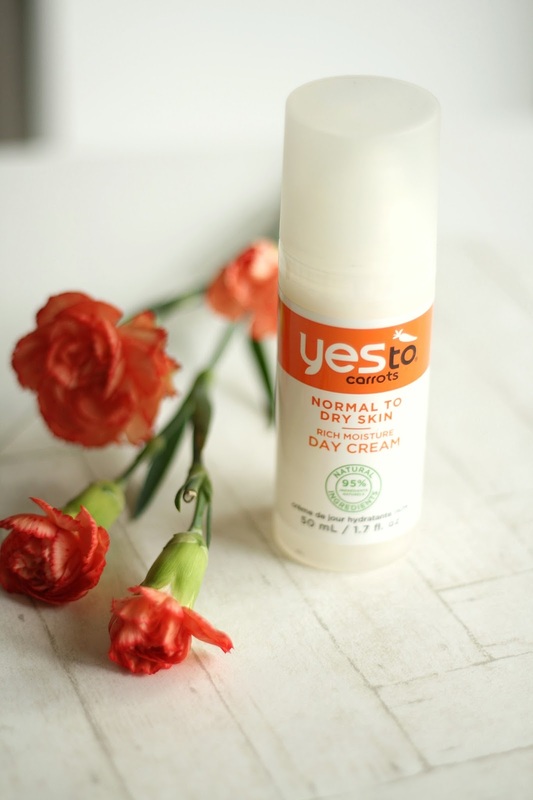 If you haven't read that then, you can do that here, but another stand out product from the brand has to be the Yest to Carrots rich moisturising day cream. The Yes to Carrots range was the original of the Yes to family, over time they have grown and produced a lot of other ranges, leaving us with multiple products to try depending on how our skin behaves. My skin is pretty normal, with the odd dry patch here and there so the Yes to Carrots is perfect for me. Yes to Cucumber products are suitable for Sensitive Skin. Yes to Grapefruit is suitable for uneven skin. Yes to Tomatoes products are for those with Combination skin. Yes to Coconut is a range for those wanting to hydrate and restore their skin and finally Yes to Blueberries is for those who have fine lines and wrinkles. So as you can see they have everyone covered! Don't you just love it when a brand does that! So onto the Rich Moisturising day cream* from the Carrot range. For those of you who like mostly natural products and those that are cruelty free, this is a brand for you. All the ranges include at least 95% natural ingredients. The following in particular can be found in this moisturiser... Carrots which are a natural antioxidant which will protect your skin. Shea Butter, which restores your skins suppleness and improves the appearance of dry skin. Sweet Almond Oil which acts as a brilliant natural moisturiser and Avacado which provides a natural source of Amino acides, vitamins A, D & E and finally potassium. All ingredients known to help protect and nourish the skin. Knowing that this is what goes into the moisturiser, there's no wonder that my skin feels amazing after using it. The product itself comes out in a medium consistency, which sinks in to your skin relatively quickly. I sometimes suffer with dry patches around my nose, since using this moisturiser daily, those patches have not made an appearance which is nice! I really like the packaging of the product, the see through plastic enables me to see when I am running low. The pump dispenser makes it hygienic to use, and gives me control on how much I would like to dispense (Lets just think to what it's like using products without a pump...Estee Lauder doublewear anyone - yep lots of wastage) No wastage here! It retails for £9.99 I believe (Unless on offer) Which for a day cream I feel is pretty reasonable, especially as it works so well on my skin in particular. It's definitely one I will be repurchasing and recommending to my friends. In fact I had a few work colleagues over and ended up recommending it to them, what did they do? Go and have a little Yes To shopping session in boots that weekend! Had you heard of any of these Yes To ranges before? Perhaps you've tried them. Let me know down in the comments! 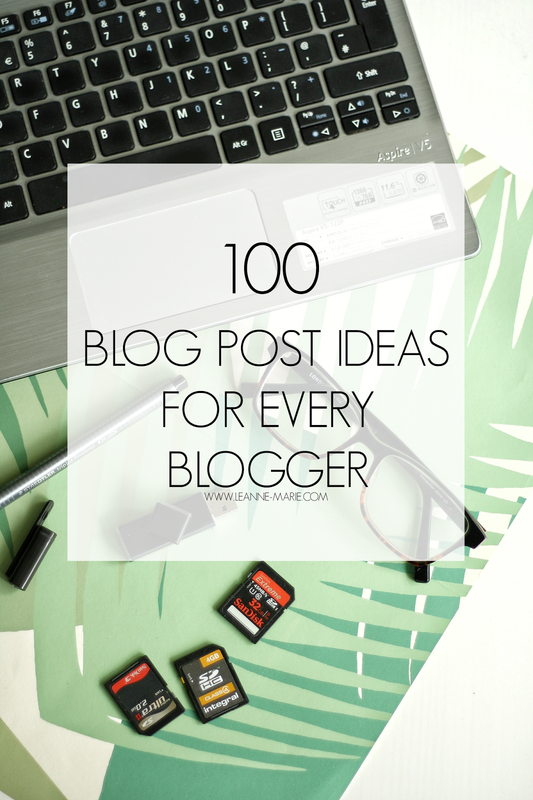 BLOGGING: 100 blog post ideas for every blogger. Writers block, it happens to the best of us. Maybe you've had a bit of a break and are getting back into blogging. Perhaps you've been on an absolute mission blog post wise and you've hit a brick wall when it comes to ideas. Maybe you just need a back up list of post titles to keep you going when the motivation isnt there.. if you find yourself agreeing to any of these points then this is the blog post for you.. Lets get stuck in shall we? 1. A day in the life - Give an insight to your daily routine. 2. What I ate in a day. - Self explanitory! 5. Link to the music artists you are currently listening to. 6. Compile a list of books you would like to read. 7. 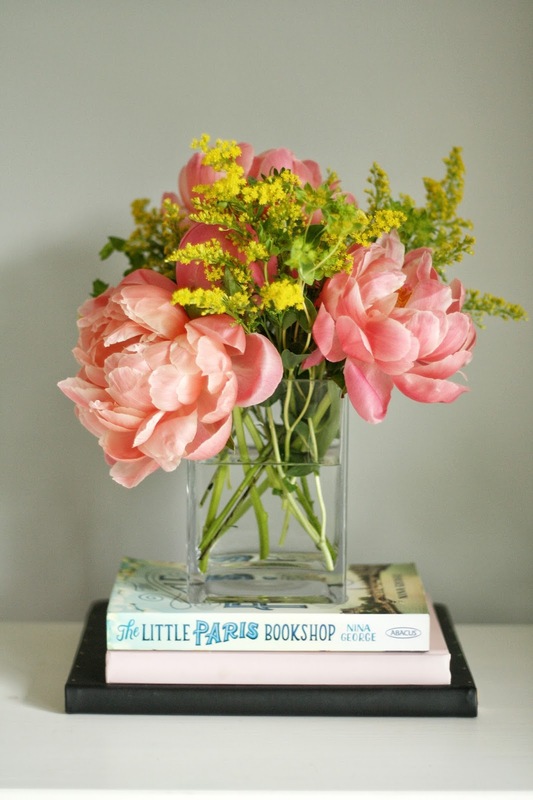 A desk tour / Where I blog tour. 8. Discuss why you started blogging. 9. Share 25 facts about yourself that people may not know. 10. Give us an insight to your bucket list if you have one. 11. Create a makeup wishlist - beauty bloggers there must be products you are lusting after. 12. A week in outfits - One for the fashion bloggers. 17. Brand Focus posts - This could relate to any niche depending what you want to talk about. 18. Explore where you live and share the things you can do in your town/city for free. 20. Travel destinations you would like to visit. 21. Talk about the beauty products you didn't get on with. 23. Do you have methods to help you relax/de stress? Share them! 24. Let us know the countries you've visited, would you recommend them? 25. Share the pros and cons you've discovered when it comes to writing a blog. 26. Review the service from an online retailer/store you recently purchased something from. 27.Are there products that are worth the hype they get? Talk about them. 28. Do mini reviews of products compiled in one post rather than individually. 29.First impressions posts - This can relate to all kinds of items and activities! 30. Facing your fears - Do you have a fear and want to conquer it? 31. Do you have a favourite recipe you like to cook? Share it! 32. Are you into fitness? Share your current routine. 33. Talk about your dreams for the future. 34. Share your favourite apps for blogging. 35. Write about your pet. 36. Style evolution - Take a trip down memory line and see how much your style has changed. 38. List your favourite inspirational quotes. 39. Compile a list of beauty dupes. 41. Fancy trying a new hobby? Pick something to do and document it. 42. Create a how-to guide for something you are passionate about. 43. Talk about the best bit of advice you've been given. 44. Fashion bloggers, share your style staples for the season. 45. Share your healthy snack ideas. 46. Recommend TV shows worth the Netflix Binge on the weekend. 47. Seen a tag post you like the look of? Give us your answers. 48. Try a 30 day challenge & document it. 49. Do you have a soundcloud/Spotify playlist? Share it! 50. Share some of your favourite posts by other bloggers. 51. The classic, 'What's in my handbag' post. 52. Talk about an event you recently attended. 53. Review a book you recently read. 57. Host a giveaway for your readers. 58. Share your tips for saving money. 60. Round up your favourite Snapchat accounts to follow. 63. Discuss a pet peeve you may have. 64. Talk about a tradition you have in your family. 66. A photo diary for your holiday - Make your readers want to book a trip away! 67. A you the King/Queen of flat lays? - Share some tips. 68. Share what you think makes a perfect guys/girls day out? 69. Do you love jewellery? Put together a wishlist. 70. Tell us why you love being a blogger. 71. Ask for Q&A questions on one of your social media channels & answer them in a post. 72. Wanderlust - talk about the places you'd like to visit around the world. 73. Share some advice you think your readers would find worthwhile. 75. List the things that make you happy. 77. Watched any good films recently? Review them on your blog. 78. Share your daily/morning/evening routines. 79. Ate somewhere recently that was awesome? Post about it! 80. Had a bad experience somewhere? Rant away..
81. Are you a really tidy and organised person? Share your tips! 82. Do you have some favourite apps on your phone? Let us know. 83. Do you have pets? Introduce them to your readers. 84. A monthly round up of all the posts you've published that month just incase anyone missed them. 85.Have a look online for Tags that are going around, take part in one. 86. Wardrobe wishlist, who doesn't browse online and add items to their saves on Asos?! 88. Do you like to experiment with makeup? Recreate a celebrities look from an event. 89. Help other bloggers out with words of wisdom you've gained over the years. 90. Share the work of other bloggers in a round up post if you've enjoyed what they wrote. 91. What do you do after you hit publish? Share your promotional strategy for your posts. 92. Talk about your haircare routine, what products do you use. 93. Best and worst wardrobe buys. Which items were worth it. 94. Talk about the beauty products you would repurchase. 95. Feeling grateful? Make a list of all the things you are grateful for. 96. Share ideas on what you can do on a rainy day. 97. Try out a digital Detox and document your experience afterwards. 99. Your most worn items in your wardrobe. 100. 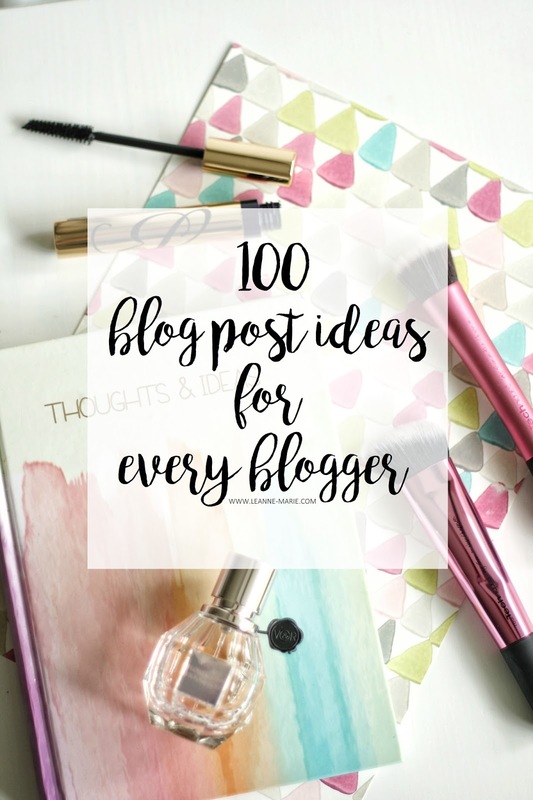 Put together a list of blog post ideas to help inspire other bloggers! I hope these post ideas have been helpful. Don't forget to have a look at my previous post 30 blog post ideas for every blogger for more inspiration! Please feel free to Pin them to Pinterest, share on Facebook, Tweet the post to help others stuck in a bit of a blogging rut! Maybe it's because we've just paid off the holiday we are going on in September. Perhaps its the endless snaps of people on instagram in sunnier climates getting their tan on.. Maybe it's the fact its JUNE so we should be spending our hard earned cash on summer appropriate clothing (despite the odd bit of rain that keeps making an appearance!) Well I've been looking online for some cute summer sandals to add to my wardrobe and I found these gems while browsing many a website! All for under £25! You've got some classic strappy sandals. Some embroidery. Comfy espadrilles, don't you just love the Beach Bum ones?! Some heels for those summer evenings. A variety of colours and styles for everyone! I want to buy them all! Click on the photo to buy! On a recent trip down to Gunwarf Quays in Portsmouth, I couldn't shop without popping into the Cosmetics Company Store. For those of you who haven't heard of this shop before, it's basically a shop that sells products from premium beauty bands at a discounted price. There's a few dotted around the UK. I went to the one in Portsmouth, but you can also find them in Bicester, Swindon, Cheshire, York & Somerset. Those are the locations that I am aware of, there may be more..if you have a designer outlet village nearby there's a high chance they will be there, as that's where they are situated in the aforementioned places within the UK! It's very much pot luck when you visit a CCO. You cant really go there with something in particular in mind to buy because there's a chance it won't be there. From the couple of different ones I've visited they do seem to stock the same brands in most. Brands you will find are likely to be MAC, Smashbox, Estee Lauder, Bobbi Brown, Clinique, Origins, and Aerin. However be warned that it tends to be a right mix of products and shades. From the multiple visits where I have gone along to a store there are a couple of products that do seem to always be there. This is mainly clinique and origins skincare, Estee Lauder doublewear foundation and Bobbi Brown eyeshadow palettes. Because of the wide variety of products available you can spend some time in a CCO. They also do perfumes, haircare, makeup tools etc not just makeup products. Conveniently for Tom there was a bench situated right outside the store in Gunwarf so he set up camp there with a coffee while I had a browse! In the end I bought myself a couple of things from Estee Lauder. I always try to pick up Double Wear foundation from a Cosmetics Company store if they have my shade. Despite the fact I really love this foundation for its high coverage and longevity I don't buy it that often. It's one I only buy if I got to an outlet village rather than rushing out to get as soon as I finish a bottle. This is purely because it isn't a foundation that I wear on a day to day basis, so I don't feel there's a need to spend a high amount on a foundation that wont be used that often. 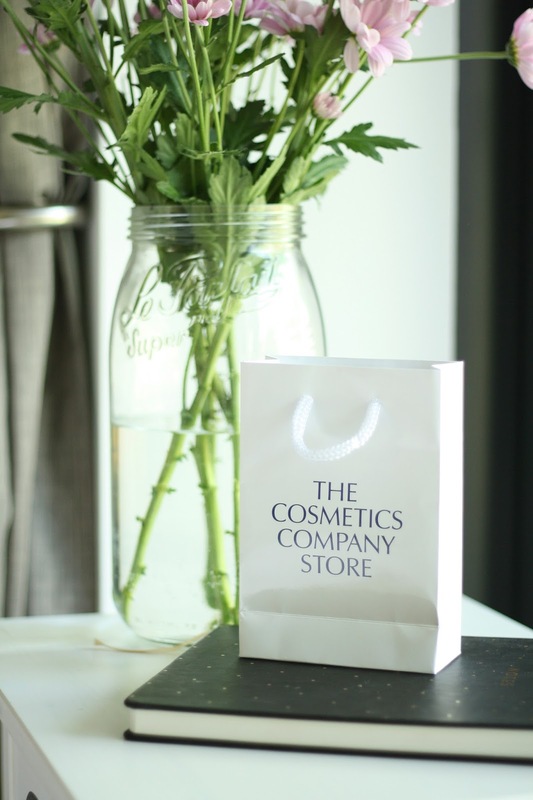 At the CCO it costs £21 rather than the usual RRP of £30 from counters in department stores so you do make quite a bit of a saving. Having tried a mini sample size of the Estee Lauder Sumptuous Extreme Lash mascara I decided to buy the full size version they had in store. The store in gunwarf only had a few of these left on the shelf so it was clearly quite a popular choice! This would retail for £24 normally but I purchased it for £16. So again I made a decent saving by purchasing it there. Have you ever shopped at a Cosmetics Company Store outlet before? - In May I finally manned up and tried an exercise class. I've started attending 'Clubbercise' once a week. Now, the fact this class is entirely in the dark with the exception of a few disco lights may have swung my decision to attend. I feel a lot less self conscious as its in a dark room! With glow sticks in hand, I have a 45 min cardio workout every Tuesday evening. For those unaware of Clubbercise, it's basically aerobics, but it's in a room decked out like your secondary school disco! It isn't too intense, it gets my heart pumping and it's better than sitting on the sofa on a Tuesday evening! I found my local class through Facebook, so if you are thinking of giving it a go have a search on there for somewhere near you. - May saw me go for the big ol' chop! I havent debuted my new hair on the blog yet, however I have posted the odd photo over on snapchat (xo_Leannemarie is my username) My hair was definitely in need of a good cut, so I just decided to go for a sort of Lob. Even though I prefer how it looks when its got a bit of a wave to it, I am trying to avoid the heated appliances as much as possible. I believe that bleaching it really blonde last year and using the hair straighteners and curlers on it often took it's toll. Before the cut my hair was actually lopsided where so much had broken off! Now I'm ready to keep my hair in a lovely healthy condition! I'm still getting used to the length! - Tom took park in two 10k runs this month, and consequently I ended up signing up to a 5K run for June! Ahh. I need to go out on a few more runs outside around where we live to get used to Road running rather than the treadmill. Tom and I are so different. I prefer running on the treadmill because I find I'm more disciplined when I am on it. I will look at the time or distance and will not stop till I hit my target for that session, whereas if I go out on the roads, I will easily give up and start walking! I think this is because I dont have a time or distance countdown right in front of me in my eyeline, therefore I feel like I've been running for a long time/distance when in fact it's been a couple of minutes! Regardless of how much 'training' I do for this 5k. I'm just going to take it easy. The entire day is for charity anyway so it's for a good cause. No different to a quick gym session on a Sunday morning right? What did you get up to in May? I think apart from the 5k charity run I have planned June is looking to be a pretty quiet month for me! I have a few lipsticks in my collection, and realistically I could get rid of a few of them because I just don’t wear them that often at all, swiping some colour on my lips had always been an afterthought, and most days I would just go without. However things have changed in recent weeks since discovering the ‘My lips but better/oh this shade is so wearable and works for all occasions’ lipstick. I wasn’t on the hunt for a lipstick, but when I was gifted a couple of Urban Decay goodies after a event, rather than passing it onto my sister I decided to try out the Revolution Lipstick in Naked for myself....well it was love. The pigmentation, the ease of application and creamy consistency, I was sold. I know its become a firm favourite because it’s started to mould into the appropriate shape for my lips (You know what I mean right?) Proof that I am applying this a lot more often than others in my stash. It’s a definite my lips but better shade, which is perfect for me. As i’m not one to focus on the lips anyway, wearing a lippy that gives you that little something extra without being a ‘OH MY GOD LEANNE PUT LIPSTICK ON’ shade is a winner in my books. I’ll get the odd question of what colour I have on my lips, so it is clear there is something on there, but it’s not too offensive to the eye! Perfect for those of us that want to start wearing lippy but don’t want to jump in all guns blazing with Macs girl about town, or something else equally as bright! The Urban Decay revolution lipsticks retail for £15.50 which is more than your average drugstore lippy. However, as this is one that I clearly enjoy wearing on a regular basis, I don’t mind paying that price. The shade range in this line of lipsticks is insane. There are 22 different shades to choose from, ranging from your nudes right across to your deep purples there’s a shade to suit everyone. I’m impressed by the quality of the Revolution lipstick. The longevitiy is pretty impressive, I only find I have to reapply a couple of times a day. The packaging is pretty. Not that that has any impact on the lipsticks performance, but obviously as a beauty lover looks are sometimes important when it comes to products! Urban decay have also brought out some other lipsticks in the revolution range. This includes Sheer Revolution and Matte Revolution. I’d been keen to have a look at the shades in those ranges as it would be nice to have three go to lipsticks in a variety of different finishes. Have you tried any of the Urban Decay Revolution Lipsticks? If not I highly recommend getting to a counter and having a good swatch fest on the back of your hand!